These chamsas are colored with a glaze called Pussywillow which shows up as a light matte blue when applied lightly and a darker, slightly glossy blue when applied more heavily. It doesn't show that well in the photos. This is another in a series of spiky pots with faces drawn from Treasury of Fantastic and Mythological Creatures by Richard Huber. This one is from a bronze figurine from the nation formerly known as Upper Volta. 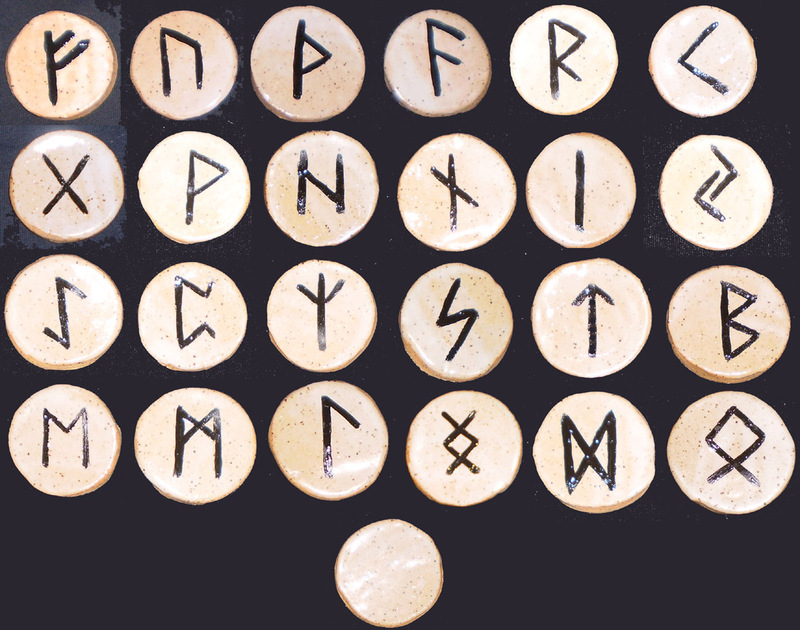 I posted a set of rune stones in 2010. I made another blank set and never got around to painting them until today. Everyone knows that alphabets are magical and can be used to accurately predict the present; the Nordic/Germanic Futhark alphabet is no exception. 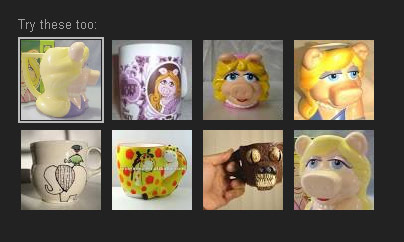 This is a Google Image Result that groups my Vicious Animal Mug with some Miss Piggy mugs. I feel that I'm in good company. These were intended to be two more spiky pots about 6 inches high and 6 inches in diameter. The first one turned out to be more elaborate than I was expecting and I realized that if I covered the side and back with spikes, there would be no way to pick it up without damaging the spikes. So I skipped the spikes. View the completed Bhutanese Demon Pot here. View the completed Nepalese Spiky Pot here. 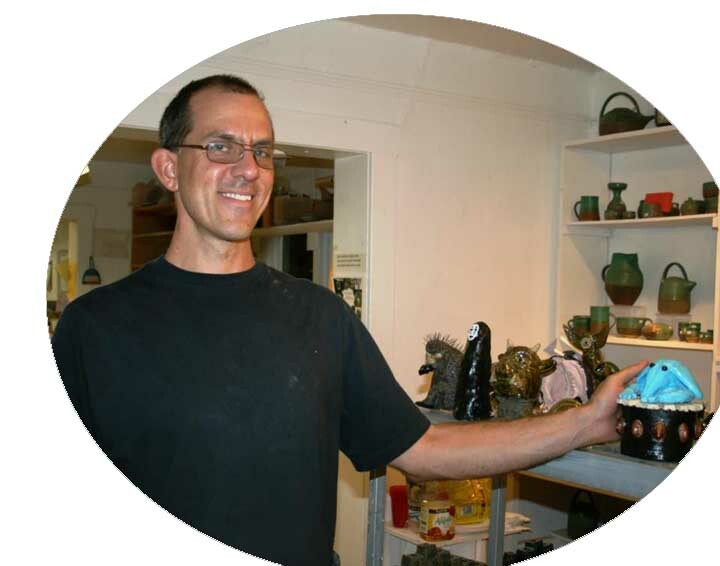 This is a hand-built slab/coil pot with a chwidencha on the lid. 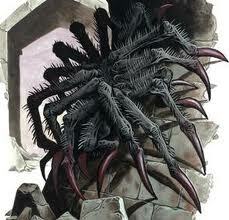 A chwidencha is a Dungeons & Dragons monster resembling a spider with an abnormal abundance of legs. I love the onomatopoeic name, the sound the thing makes as it scuttles across the stone floor towards you in some dank pit to paralyze and devour you. 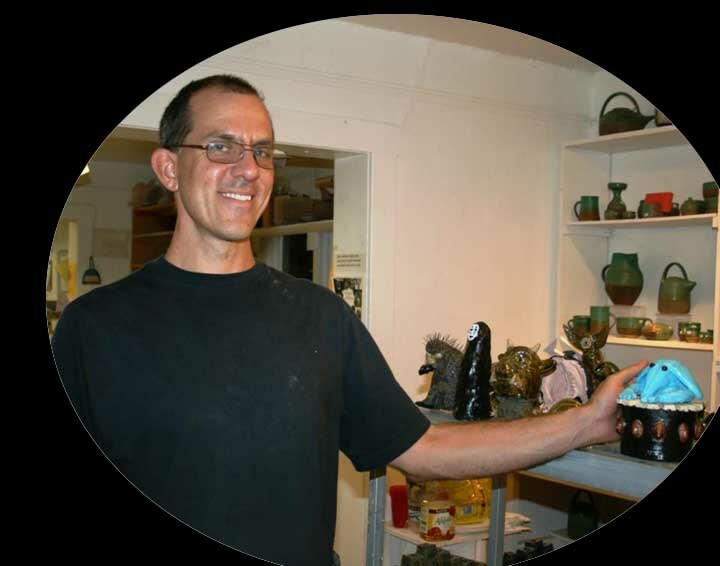 The pot is uneven and asymmetrical. The chwidencha is more spider-like than my last one, but I still haven't solved the problem of creating the illusion of sharp angles necessary to make the jointed legs of arthropods look natural. View the completed Red Chef here. In December, I bought two chef figurines at a dollar store. 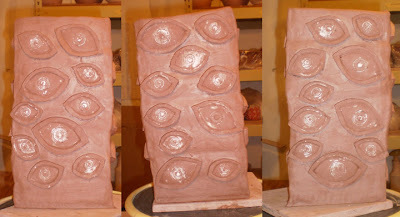 I made molds of their faces and objects from the molds in this post. Tonight I made a copy/interpretation of one of the chefs. The figure itself is a distortion of human anatomy and I added another layer of distortion myself. The arms were the most annoying part. The left arm seems more distorted than the right arm, but I couldn't figure out what was making it look off. This is a clay interpretation of an extremely flattering self-portrait by R. Crumb. I like how it came out except I couldn't get the lines around the mouth right and the nose looks weird. Noses never come out the way I want them. 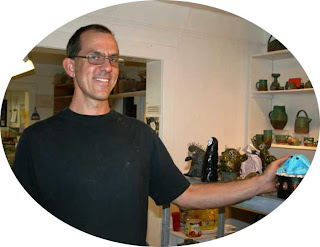 This is a clay ornament which I posted on this blog a few years ago, but I was using low quality images that were also too small. 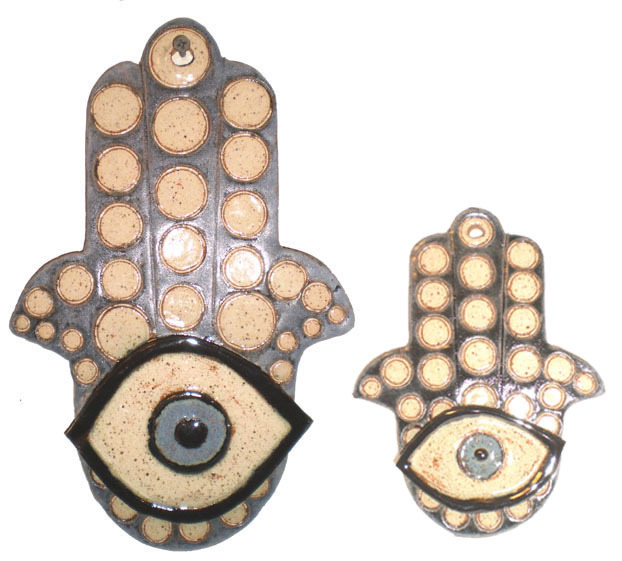 I just listed it on Etsy and I'm posting it again here with a better image. This is a surrealist object from 2010 meant to be hung on one's wall. 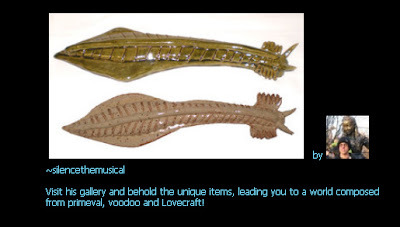 The shape has a cross at the top and Cthulhoid tentacles at the bottom. The central image is of an angry nun, the mold of which was taken from a wind-up fire breathing nun toy which breathed sparks out of its mouth. The other molds include tiny skulls from a Halloween decoration, a large skull from a Meerschaum pipe from Turkey, and frogs and a lion from some Japanese toys with interchangeable heads. This is a sculpture of a Dungeons & Dragons monster called the chwidencha. It resembles a spider that is almost all legs. I gave it a head because my tiers of spider legs weren't dense enough to obscure the inside and it made more sense for it to have a head under there somewhere. This piece was practice for the Chwidencha Pot. I like how the glazes came out, but it lacks the angularity that would make it look like a real arthropod. My friend who commissioned the Big Spiky Pot last year asked for another one. It's based on a Balinese design. Here is a more complete view. Leo Lionni's surrealist botany textbook Parallel Botany was one of my earliest inspirations for creating clay objects. I've made numerous giralunas, night-blooming flowers described by Lionni as the "most parallel of plants, most plantlike of the parallels." 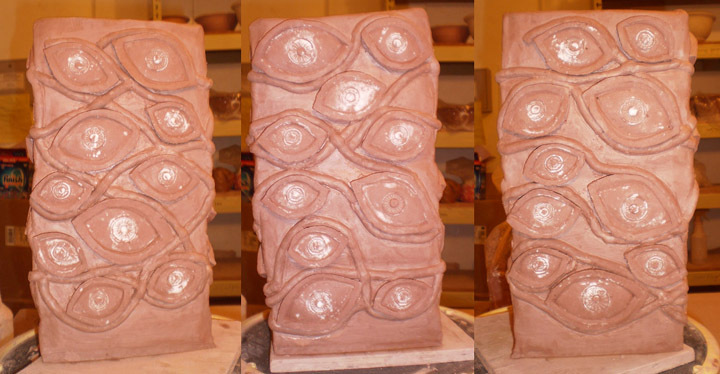 This one is about 15 inches tall and is my first piece that won't fit on my shelf. 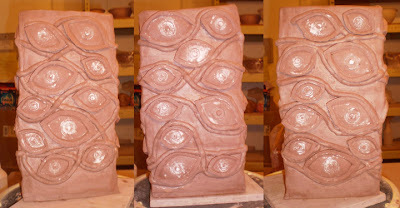 Here are the underlying slab pot and the finished giraluna with tendrils, petals, and molded eye. This is a triangular slab/coil pot with 30 eyes. I added some of the connecting pattern, but I don't think I'm done yet. 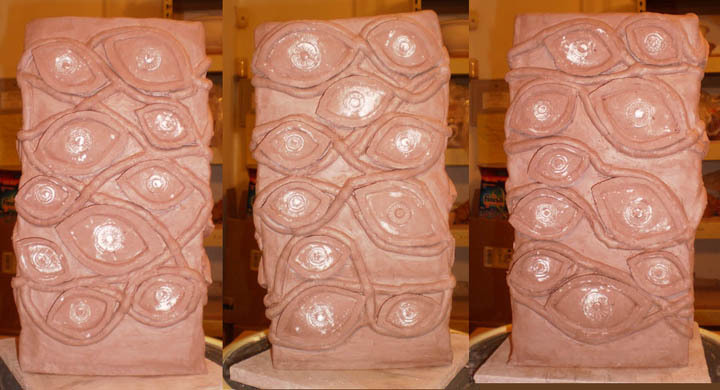 Behold the Eye Tower Pot as it spins slowly and magically in a circle while music plays.